I have mentioned in earlier blog posts that spirits can make sounds: footsteps, screams, bangs, tapping sounds, etc. And in most rare cases, spirits known as poltergeists can move or break objects. I have witnessed this first hand. 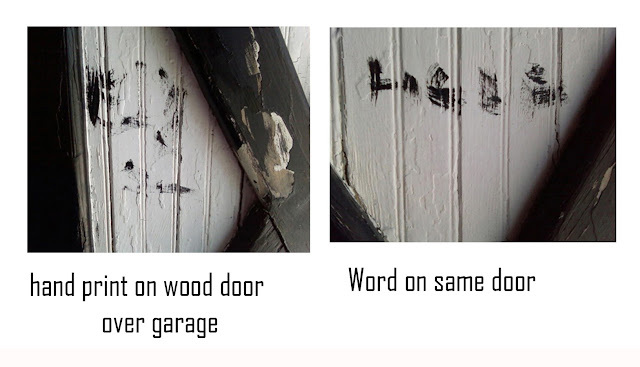 However there is other unique physical evidence that is part of a haunting situation- unexplained writing on paper or walls; hand-prints and fingerprints. Can a ghost or entity leave a visible hand-print/fingerprint? Roughly half of the paranormal experts say yes, and the other half say no. Nobody knows for sure. Personally, I believe they can. Judging from the hundreds of images put up on Google by people documenting ghostly hand and finger prints, there is something definitely to this phenomenon. Have you seen a footprint or a hand-print on a window, table, or car where an entity could be responsible for the imprint? Have you been left a sign of the presence of someone in another dimension of reality? I have had these experiences in my home and have the photos to prove it. How is this possible? I know there are a few "logical" explanations, but just in general, do you think that ghosts/spirits are able to leave a physical hand/finger print when they desire? Is it purely to let us know they are around or evidence of something more sinister? 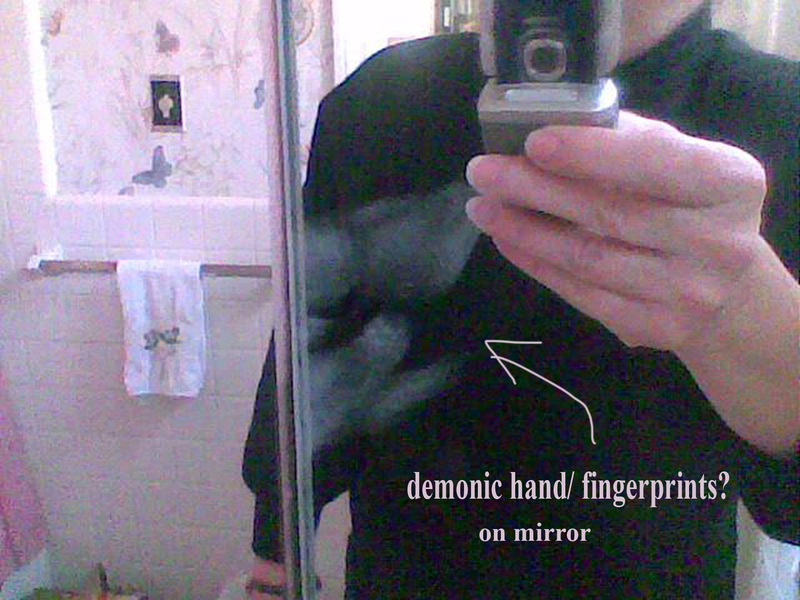 We know that spirits cause temperature changes, (watch any ghost hunting show and they are using sensitive meters that can detect environmental changes during an investigation) and in doing research for this post someone suggested that the change in temperature around one's hand could, in theory, discolor or fog up something that was sensitive to temperature (like glass). Then, all it would take is some dust or something to stick to the fog and you have a ghostly hand print. That’s one interesting theory. 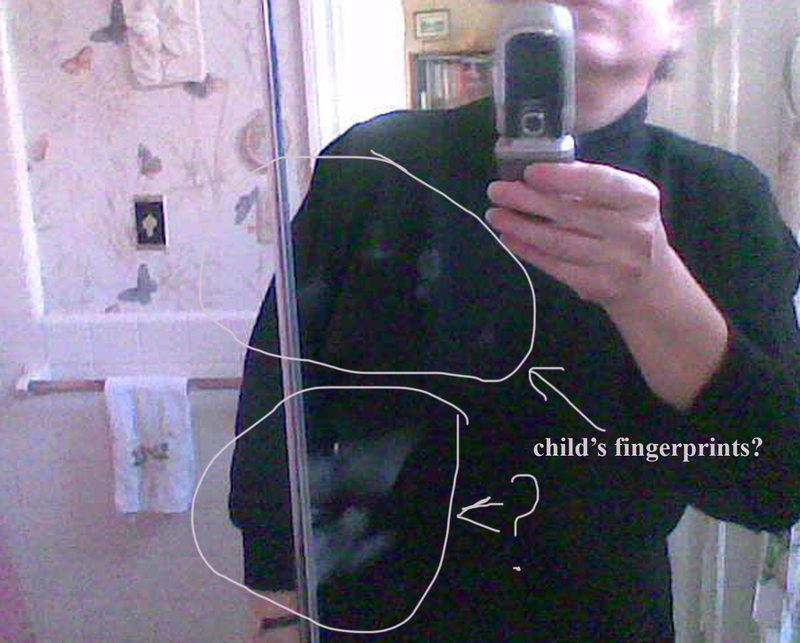 My son, Christopher had a vapor-mist appear on the back of his black T-shirt (April 2010) after a very terrifying day of poltergeist activity in our home. It appeared almost grayish in color on the back of his dark shirt and when we tried to wipe it-you could see a streak where it vanished and contrasted with the darker material and the rest of the mist left on the shirt. It all disappeared within seconds! Is this what they call ecto-plasm? Looks like ghosts can manifest some kind of semi-solid matter and manipulate temperature changes-and can they do this to leave imprints? I first noticed a weird looking finger print on our downstairs bathroom mirror several years ago. This was a very active time for paranormal occurrences in our house. At the same time, my son was experiencing very vivid and horrific dreams of recently deceased people visiting him at night during the summer of 2010 (a post on just that subject will be a future blog). The placement of the print was odd and in the crease of one the 3 paneled mirrored doors above the vanity and not where you place your hand to open the door-that’s at the bottom of each panel. 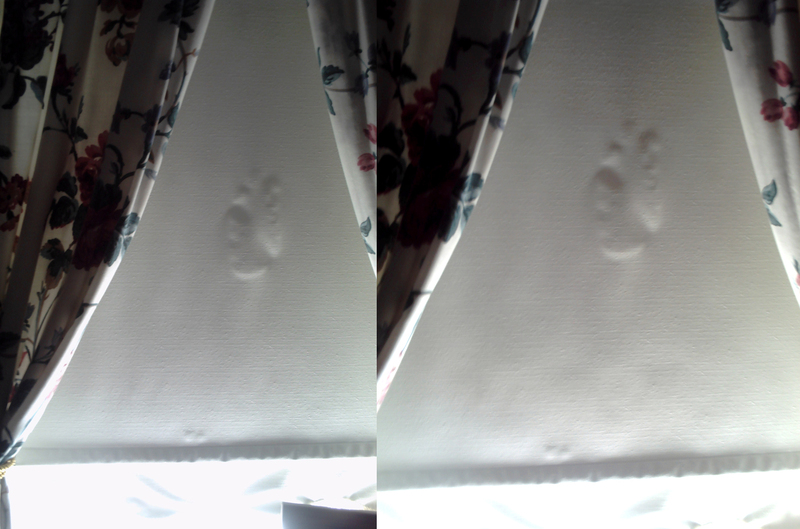 I didn't pay attention to it but the next day, while in the bathroom, something foggy caught in my peripheral vision-smaller fingerprints-like a child’s- above the first set of fingerprints. For the next week a series of fingerprints appeared below these first prints until they extended down to the end of the panel. Very Strange! 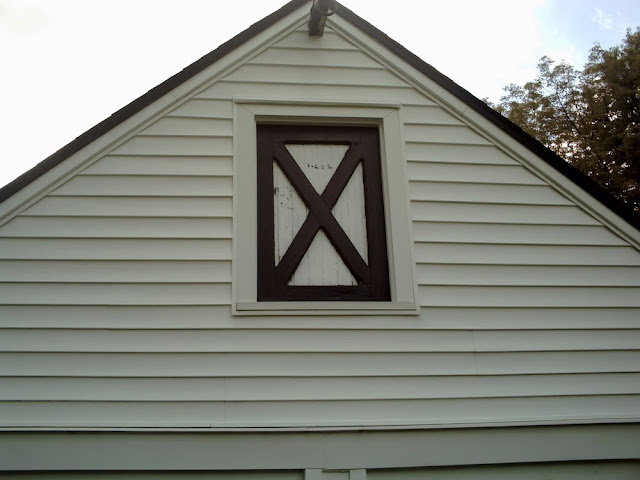 **Later a psychic friend saw the door and got the number 8 associated with It. We found out later what the significance of this was. My son told me that there are several young ghost children presently haunting the house that came to him in separate dreams and gave him their names. One is an 8 year old boy who died over 150 years ago and his name relates to early settlers whose farm originated less than ½ mile from our house! Several trusted mediums all have confirmed that my son is correct about our ghostly residents! In February 2013 unexplained hand-prints appeared on our glass coffee table in the living room. 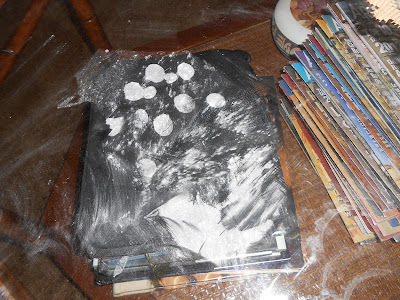 (I had seen something like this before but only thought them our prints and wiped them off with Windex). After putting baby powder over them we were able to get a good image with our digital camera. We then saw that there were not 2 sets of prints but another smaller set over them! Possibly a child’s? We also can see actual ridges of the fingerprints in several of the marks. These were the best prints we've seen on the glass surface. After posting these photos on my Facebook page in February, 2013, I was contacted by a very reputable ghost researcher and hunter that they were of a demonic origin! We could be in serious trouble! She contacted a well-known spiritual minister (who had dealt with this type of thing) who come to our home and did a 4 hour blessing-which we can never thank him enough for his help. We were told that these glass surfaces/mirrors, etc. support or become open portals and let the entities whether good or bad in. We photographed and documented them and then erased them from the surfaces. Things seem to be more peaceful for a few months-no more prints. Stay tuned, and in the meantime I'm trying to match and buy a new window shade!